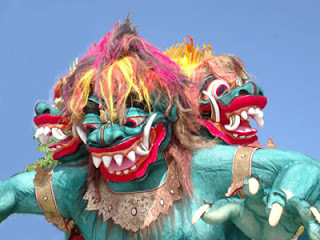 This friday, March 23th, it will be 'Nyepi' in Bali. Nyepi is the Day of Silence for the Hinduistic Balinese. From 6 a.m. till 6.a.m. the next morning, the whole island is silent and dark. The Balinese will fast, meditate and reflect all day. They are not allowed to leave their houses...This way, evil spirits will think Bali is deserted, and then won't visit the island.